We are the premier dealer for inTech Aluminum Trailers. Home of the highest quality race trailers and custom stacker trailers worldwide! Brad Sellers, founder and owner of RPM Trailer Sales, set the standard by which all others are judged! So if you are an experienced racer, prepare to be impressed with the accuracy and detail of what you will receive when you custom build a trailer with RPM. 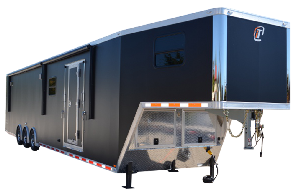 We specialize in custom motorsports trailers, stacker trailers, aluminum gooseneck trailers, and aluminum motorcycle trailers. We will deliver locally or ship nationwide, as well as international destinations. If you are interested in a premium quality product, then you are in the right place. If you have had the opportunity to walk through the pits of most any drag strip, road coarse track, circle tracks, or bike rally, you have witnessed our creative minds and our passion to build products that others would not even attempt. If you are a just getting started, do yourself a big favor, and begin with the very best! Ask the professional builders of any product, and they will tell you that top shelf quality does not come off a mass production assembly line. RPM Trailer Sales is committed to satisfying the unique needs of each of our customers by providing a premium quality custom product at an affordable price. We take pride in the fact that we bring into the world the best custom aluminum trailer money can buy. Making sure that each part of the trailer, no matter how insignificant, is of the highest quality possible, we create a trailer that is more than just the sum of its parts. We create a trailer unique for your personal needs. If you can dream it, RPM Trailer Sales can build it. Call us for professional advice, support and service at 1-877-776-8812. Or visit our Georgia Trailer Sales Location and experience the RPM Trailer Sales difference when purchasing your next race car trailer, custom aluminum trailers, stacker trailer, or any other specialty trailer you may be interested in.